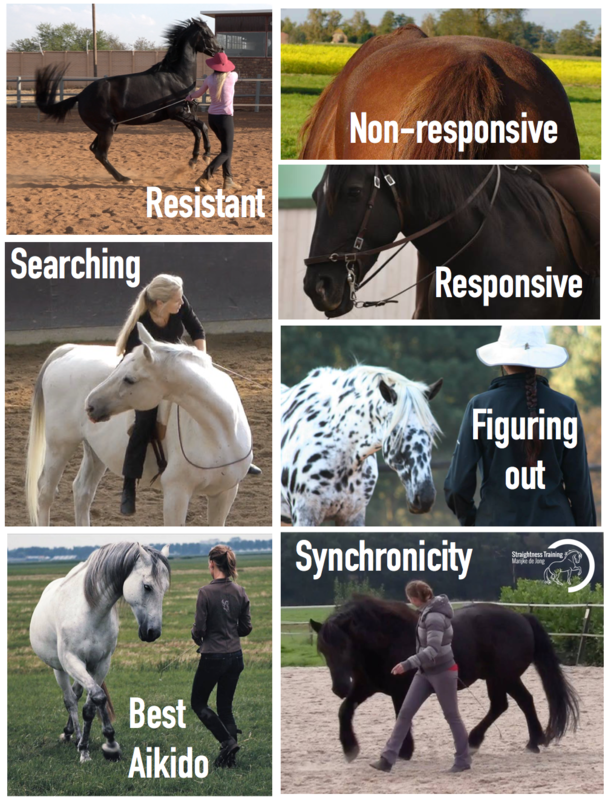 In Straightness training, we have defined 7 mental states of the horse. Of course this is just a framework, and the map isn’t the territory anyway. But the good thing about maps, is that you can navigate through the ST jungle easily. “Ever heard of the different mental states of the horse? It’s a fascinating concept of Straightness Training. It’s about how engaged, willing and motivated our horse is during training. You see, in Straightness Training, it’s not only about the physical quality of the movements, it’s also about mental qualities. 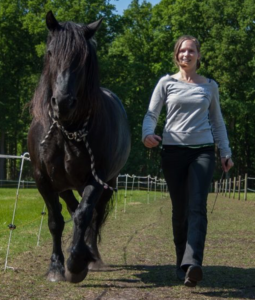 The horses (and actually also humans ) grow not only in muscles but also in their mental states during their Straightness Training journey. 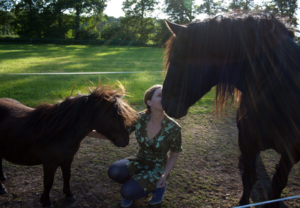 Our horse resists when we ask something, pushes into us, pulls the reins, gets nippy or even bites or kicks. Our horse doesn’t respond to our requests, ignores us. Our horse responds to our aids, but isn’t really thinking about the actual behavior he has to do, and just follows our guidance as a sort of “puppet on a string”. Our horse searches for the reward, knows that there is also something in it for him, so he’s a bit more motivated but mostly to get to the treats as fast as possible. Our horse isn’t so busy with the treats anymore but is now thinking more about the actual behavior, asking questions like “how fast, how much, how many steps, which direction?”. On top of the figuring out state, our horse puts serious effort in, giving even more than requested, getting really enthusiastic about the work. Here horse and rider move together as one, both putting a huge effort in but it looks effortless, moving elegantly as in a dance. Now the reason I br ing this up is that it’s an important subject for me at the moment, and I think it’s interesting to share. Many riders struggle with horses showing resistance, non-responsiveness or a lack of motivation, and I have been there, too. It’s very hopeful to know that you don’t have to stay there, you can travel through all states, and find better mental qualities in your horse! At this point, I traveled with my horse Ciaran through the first five states, now finding our way into the land of Best Aikido. Now, when two people do Aikido, they start with bowing to each other. With this bow, they show respect for each other and also promise to give each other their best. Because when you are doing Aikido together, and only one is giving his best performance, and the other is not offering much, it’s no fun for both. Even more, by not giving your best performance you won’t give your opponent the best possible training opportunity, which obstructs not only your own growth but also your training partners’ development. This is the same with horses. While you move through the levels with your horse, the whole training process becomes more and more a meeting between equals, where both learn and give their best for the other to learn as well. Horse and rider ‘bow’ for each other and give each other their Best Aikido . He tends to put not too much effort in, holding back his energy – and in response, I start to put in more energy instead. This way, we are no equal partners in work, putting both an equal amount of effort in. I close his gaps for him, instead of letting him fill his own gaps. This inhibits his growth, and mine as well because I need to be more technical in order to close all gaps and lose a bit of feel. This happened to me quite often, it’s our biggest pitfall! For us, to step up to the next level, we need to get into our Best Aikido consistently. While we are working on this, I can already see that this improves him mentally and physically massively, and it also makes me stretch and reach new levels!